Papers & interviews with Suzanne Dracius	>CLIMB TO THE SKY. Suzanne Dracius. Translated by Jamie Davis. CLIMB TO THE SKY. Suzanne Dracius. Translated by Jamie Davis. Afterword by Edwin C. Hill Jr.
"Suzanne Dracius’s reputation and renown have grown steadily over the years. 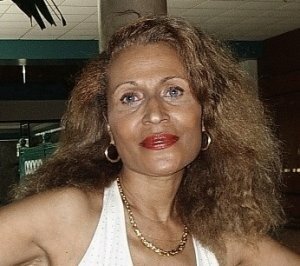 Hers is an important voice in French Caribbean literature, one that deserves to reach as wide an audience as possible. The combination of literary sophistication, historical accuracy, and feminist valorization makes this work a literary and cultural landmark." Commandez-le maintenant et nous vous l’enverrons dès qu’il sera disponible. Expédié et vendu par Amazon.fr. Emballage cadeau disponible. "Everyone please buy my book !!! (Well, it’s not MINE, but I did translate it !) Written by my brilliant friend Suzanne Dracius, "Climb to the Sky" comes out on 11/5/12 and it’s an amazing work of literature... Here’s a link !!! I’ll autograph shamelessly and proudly !" 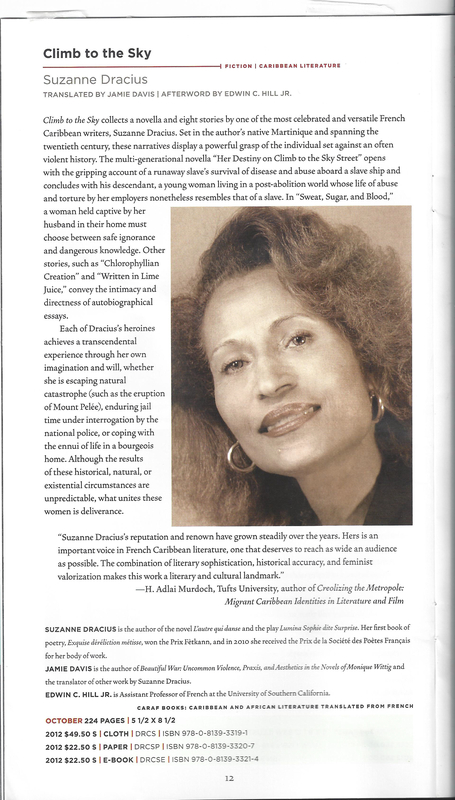 click here : CLIMB TO THE SKY by Suzanne Dracius - "Informations littéraires"
Climb to the Sky (RUE MONTE AU CIEL) by Suzanne Dracius (CARAF Books : Caribbean and African Literature translated from the French by James Davis), University of Virginia Press, USA. Climb to the Sky (RUE MONTE AU CIEL) de Suzanne Dracius (éd. CARAF : Caribbean and African Literature — Caribéenne & Africaine Littérature, Presses Universitaires de Virginie, USA — traduit en anglais par James Davis). Nancy N. Carlson - Translation of Suzanne Dracius’s "The Dancing Other"